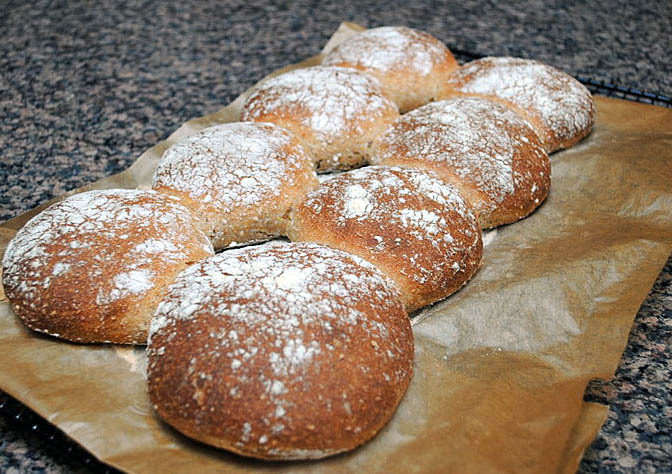 Rustic, toothsome, flavorful, and if all that wasn’t enough, these rolls are a cinch to make. 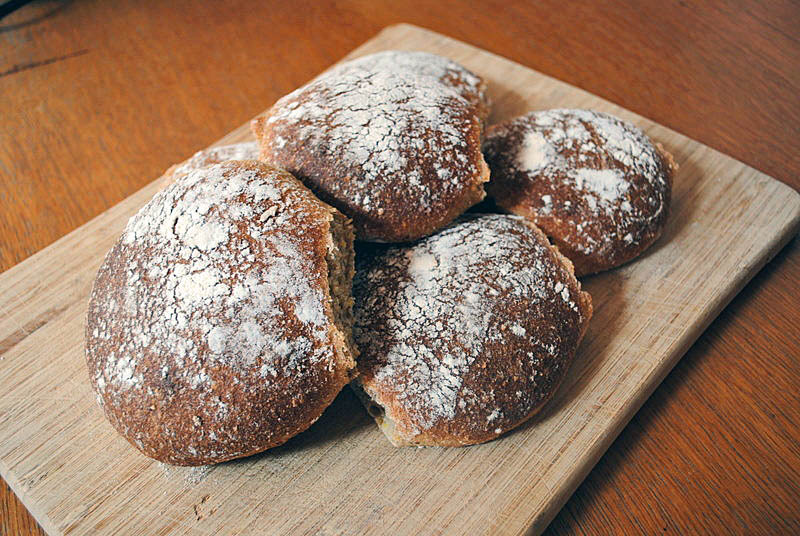 In a classic Dan Lepard’s approach, the recipe calls for minimal kneading, and because they are baked as small rolls, shaping is a breeze. The rolls also freeze quite well, individually wrapped, then placed in a low oven to come back to that freshly baked feel. Per Mr. Lepard’s request, I won’t post the full recipe. But you can find it in the database of “The Guardian” through a quick jump here. I will, however, give you a quick outline of how this recipe comes together…. 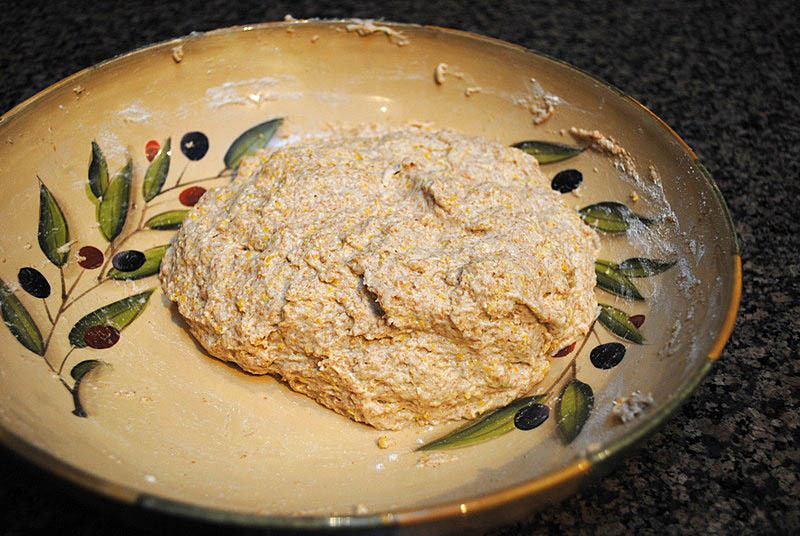 The cornmeal needs to be soaked in boiling water for a few minutes, once you do that, all ingredients – soaked cornmeal, spelt flour, water, honey, and yeast – are added to a large bowl, mixed quickly, and left standing for 10 minutes. 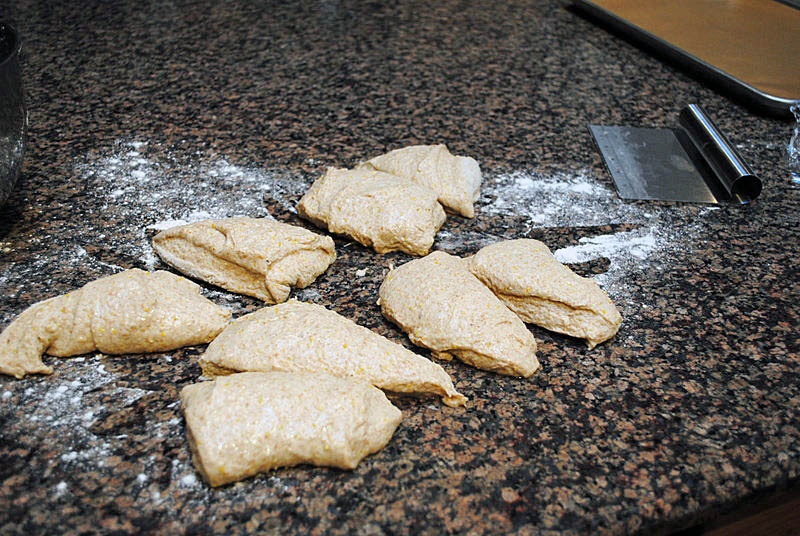 A kneading cycle of 30 seconds, a 20-minute rise (yes, that fast…), and you are ready to divide and conquer… rather, divide and shape in 8 rolls. 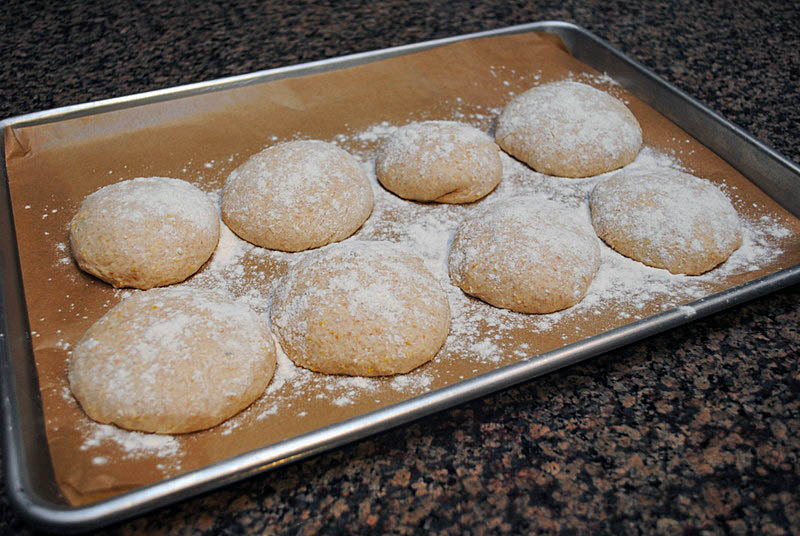 After shaping, they rest on a baking sheet lined with parchment paper and dusted with flour. Only 45 minutes to go before baking time! Once they bake, they will more or less join together, let them cool this way, breaking them apart at serving time. Adorable little rolls, dense, but in a good way… 😉 We enjoyed them in sandwiches – smoked turkey & provolone, ham, cheese, tomato & pesto sauce – but also as plain small bites with our dinner of roast chicken. They will certainly be a favorite in your home too! I often say that I don’t care much for sweets, and visitors to the Bewitching likely realize that for me, savory stuff tops the sweets by a long, long margin. But, for many years I heard comments about my youngest niece’s cake skills (a gene that must have skipped my generation! 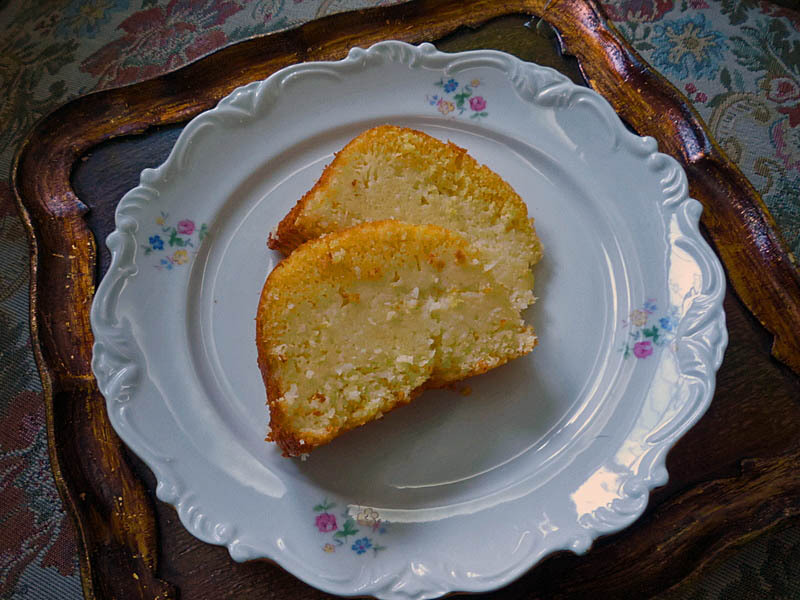 ), and now, finally, I had a chance to savor one of her specialties: a traditional Brazilian cornmeal cake, called “bolo de fuba’.” Her recipe has two interesting additions: a farmer’s type cheese and shredded coconut. Together, they produce a cake that´s moist, with just the right sweetness. If I had to describe it in a single word, that word would be irresistible. Heat the oven to 350F. Prepare a round, medium size, ring cake type pan by buttering the inside and adding a small amount of flour, tapping off the excess. Add all ingredients to a blender and mix until they form a smooth batter. Pour the batter into the prepared pan, and bake for 45 to 50 minutes, until a cake tester or toothpick comes out clean. Let the cake cool for 10 to 15 minutes before unmolding. Serve it warm or cold. 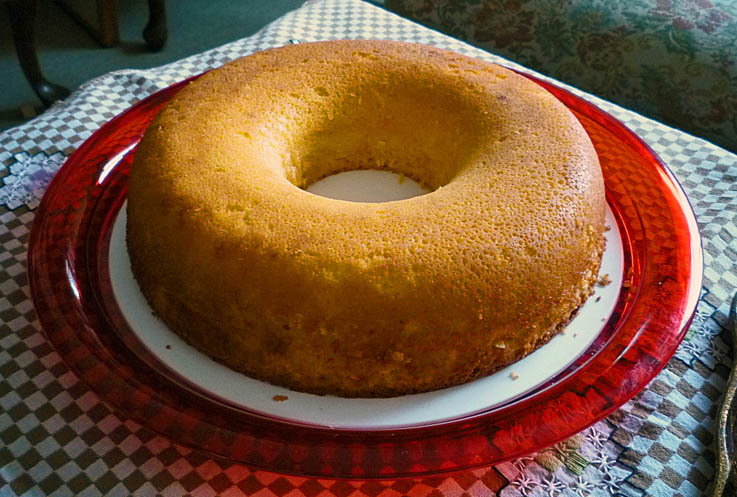 Bolo de fuba´ is the type of cake one would expect to be served with a nice cup of coffee or tea in the middle of the afternoon, or at breakfast to start the day on a good vibe. As you can see from the photo below, this cake bakes in three distinct layers, a cornmeal cakey component on top, a creamy center, and the coconut flakes in the base.